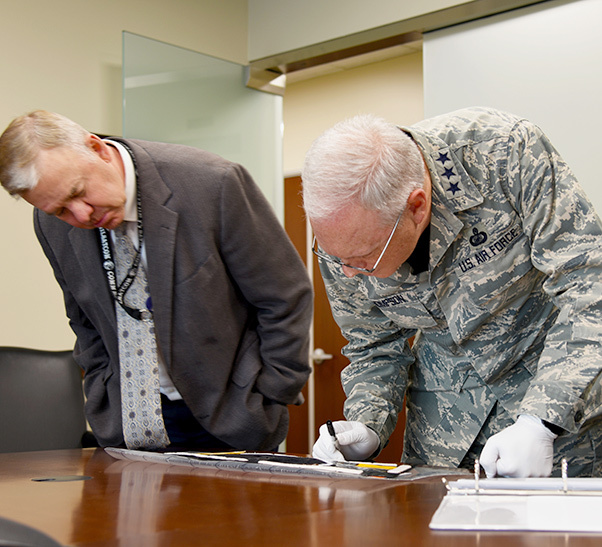 Lt. Gen. John F. Thompson, Commander, Space and Missile Systems Center, signs the thermal space blanket, at Los Angeles Air Force Base, Calif., on June 22, 2018. The thermal space blanket will protect sensitive components inside the Advanced Extreme High Frequency (AEHF)-4 satellite from extreme temperature changes during its life-span around Earth’s orbit. The Advanced Extremely High Frequency Program marked a significant occasion, June 22 when members of the leadership team at the Space and Missile Systems Center [Los Angeles Air Force Base, Calif.] the Aerospace Corporation and Lockheed Martin Space Systems Company all gathered to place their signatures on a thermal space blanket that will travel in space inside the AEHF-4 satellite this coming October. The thermal “Space Blanket” signed by U.S. Air Force and Lockheed Martin personnel, at Los Angeles Air Force Base, Calif., June 22, 2018, celebrates the partnership between the two organizations completing an important phase in the Advanced Extremely High Frequency (AEHF) satellite program. The thermal blanket’s use on the AEHF-4 satellite has the same objective as it does for humans; to help control the temperature variations that can sometimes happen during space travel or to keep the human body temperature stabilized. 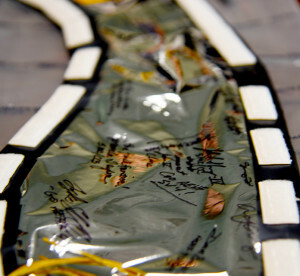 The thermal space blanket will not only protect AEHF-4’s sensitive components from temperature shifts in space but it will also ensure these parts stay within operational limits despite extreme temperature ranges that can fluctuate anywhere between minus 50 to 100 degrees Celsius.